Performing like an athlete that is both a long distance runner and a sprinter, the ODYSSEY Trolling Thunder™/Marine Dual Purpose battery has both a hefty starting power and an impressive deep cycling ability – up to 400 cycles at 80% depth of discharge. 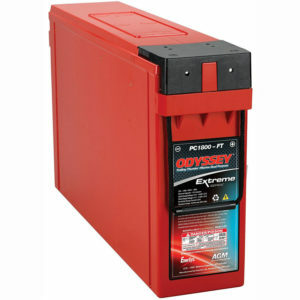 With twice the total power and three times the life of traditional marine batteries, the ODYSSEY battery perfect for starting, trolling, and for powering the many on-board electronic accessories seen in today’s boats and recreational vehicles. Better warranty. Limited 3- and 4-year full replacement warranty – not pro rata. Longer service life. With 3-10 years of service life, ODYSSEY® batteries save consumers time, money, and aggravation. Longer cycle life. 70% longer cycle life compared to conventional deep cycle batteries – up to 400 cycles at 80% depth of discharge – high stable voltage for longer periods of time. Longer shelf life. Can be stored on open circuit (nothing connected to the terminals) without the need for recharging up to 2 years or down to 12.00V, whichever occurs first. Faster recharge. The highest recharge efficiency of any sealed lead battery on the market –capable of 100% recharge in 4 – 6 hours. Mounting flexibility. Non-spillable design – can be mounted on any side in any position except inverted. Vibration resistance. Design protects against high impact shock and mechanical vibration – a common cause of premature battery failure. Extreme temperature tolerant. Operating temperatures from -40°C (-40°F) to 80°C (176ºF). Totally maintenance free. No need to add water, ever! Drycell design with resealable venting system. Improved safety. US Department of Transportation classified as a ‘non-spillable’ battery. No acid spills, no escaping gases. Superior to spirals. Compressed flat plates eliminate wasted space — 15% more plate surface area and up to 40% more reserve capacity than popular “six-pack” AGM batteries.